A very few cars can compete with the PT Cruiser style in the sea of modern econoboxes. 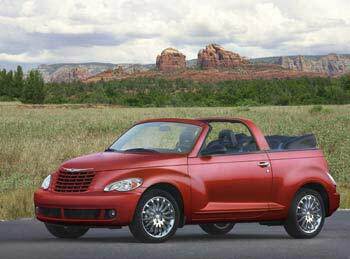 Classified in the US as a truck, the PT Cruiser rides on a car-like front-wheel drive unibody platform, with a 4-cylinder engine. It handles well and has a practical interior with easy access and versatile cargo space. Inside, the PT Cruiser looks like no other car. 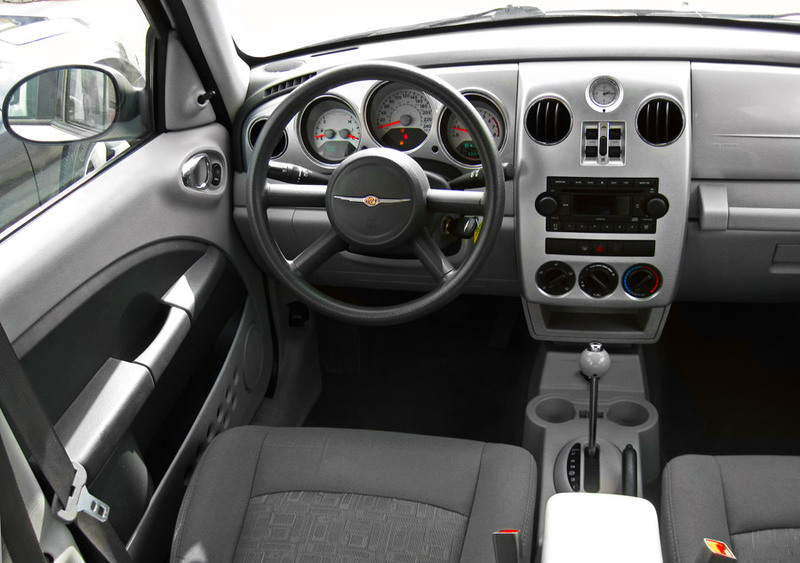 The 2001-2005 models had a center console designed in a similar fashion to many other Chrysler cars, while the 2006 and later models got a retro-styled dashboard with the old-fashioned instruments and a signature clock at the top of the center console. The access is easy. The upright driver position gives a good view of the road ahead, but the thick rear pillars reduce rear visibility. Rear seats can be folded forward or removed completely giving the PT Cruiser plenty of cargo space. Initially, the PT Cruiser was available only as a five-door wagon. A two-door convertible was added for 2005, but discontinued after 2008. Powertrain: For 2001, the only available engine was a 150-hp 2.4L 4-cylinder DOHC. This engine has a timing belt that needs to be replaced at recommended intervals. Timing belt replacement is labor intensive and could be costly ($500-$750 parts and labor). A turbocharged version was added for 2003. Read also: Should you buy or avoid a turbocharged car? Transmission choices included a five-speed manual or four-speed automatic. Handling and ride: On the road, the PT Cruiser is easy to drive. Ride is firm, but road bumps are absorbed nicely. The non-turbo engine feels a bit underpowered on acceleration, but is adequate around-town. On the downside, the turning radius is wide and the road, wind and engine noise are noticeable at higher speeds. Pros: Original style, easy to customize, versatility, cargo space, available as a convertible, easy access, affordable. Cons: Fuel economy, lack of passing power on non-turbo models, low front end scrapes easily, depreciates fast, below-average reliability. Overall: On one hand, the fuel economy is not very good and the reliability is below average. A cramped engine compartment makes it difficult to work on; for example, to change the spark plugs, the top part of the intake manifold has to come off. The PT Cruiser doesn't hold the value very well and there are plenty of complaints about electrical, front-end and other problems. An extended warranty is worth considering for these reasons. On the other hand, it's still an eye-catcher and it's not very expensive. The PT Cruiser has a roomy practical interior and versatile cargo space. It's fun to drive and you can get a convertible too. There are so many accessories available, that you can customize your Cruiser in any possible way. Read about common problems and what to look for on the next page.